Don’t try telling Bristol light-middle Danny Butler that punchers are born and not made. 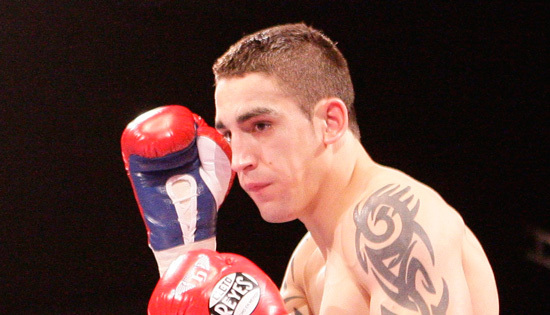 The 28 year old former Junior ABA champion and Young England rep stopped just three of his first 22 opponents after joining the paid ranks as a teenager a decade ago. But since linking with coach Andy O’Kane and dipping to 154, the affable West Country lad has been starching opponents for fun. And dangerous Danny told Glynn Evans he intends to continue the carnage when he squares off with Wembley’s unbeaten Gary Corcoran on the bill topper at York Hall this Friday. The vacant WBO Inter-Continental Super-Welter belt is up for grabs. After turning pro at 18, your only reverse in your opening 19 gigs was a three round split decision to quadruple world title challenger Martin Murray in Prizefighter. However, from November 2011 until October 2013 you endured a nightmare spell, losing four of five, albeit in good company. How do you account for that? Things weren’t right with my back-up team at the time and I needed a change. As soon as I switched camps, from Tex Woodward to Andy O’Kane four years ago, it gave me a lift. It was like starting again from scratch. Andy re-developed my style and I started learning new things. Fighters usually move up in weight as they age yet you’ve dropped down from middle to super-welter since switching to O’Kane. What fashioned that decision? Clearly it’s working. You’ve won six straight with five stoppages! I now do a lot more strength and conditioning work and my fortune changed immediately. Under Andy, I train a lot harder, diet right and the weight just dropped off so we decided to give 154 (pounds) a go. Even when I was fighting up at middleweight, I was weighing two, three, four pounds inside the limit. I was always a smaller middleweight so dipping down to 11st really hasn’t been too much of a struggle. Now I’m a big light-middle. I’ve taken my power down and I feel a lot sharper. People have to understand that I turned pro very young and I guess I’ve just physically matured. I only stopped a handful as an amateur. And I’ve proved I carry my power late. I stopped Thomas Costello in the tenth and last round. While Friday’s fight is billed as for the WBO Inter-Continental title and could secure the victor a world rating, it’s effectively a British title eliminator? What significance do you place on that? Huge. I try to stay 100% focussed on the job at hand but that’s the title I want. (Champion) Liam Williams and me are quite local but we stay away from each other and haven’t sparred. But it’s potentially a huge fight for Wales and the West. I had a taste for it before when I challenged Darren Barker for the British middleweight title at two days notice after Wayne Elcock withdrew (LRSC7, November 2009). It was three days after my 22nd birthday, everything was a bit rushed and I fell short against a very good champion. But that’s done now. I don’t dwell on it. Eleven stone is a great division in Britain, headed by Liam Smith and Williams. Everyone in the top ten has great talent so hopefully they’ll not avoid each other and fantastic fights can be made for the fans to enjoy. Opponent Corcoran has a reputation as a rough handful, who is unbeaten in 14. What’s your assessment of ‘The Hellraiser’? Good fighter, storms forward, throws a lot of leather. I tend not to study opponents too much cos they can change fight to fight. I just try to cover every aspect, no stone unturned. I definitely don’t underestimate him. But whatever he brings we’ll be prepared for. I’m probably the more polished boxer but I’m more than happy to stand and trade with him. It’s a great fight. I’ve had a good 10 week camp and I’ve trained so, so hard; 110% very single session. I’m really excited by it. Gary’s a proud Irish traveller, based in Paddington, west London. Are you daunted by the prospect of facing him in the capital? Not at all. I’ve been fighting since I was seven years old so I’ve learnt it doesn’t matter where the ring is, there’ll only be two of us fighting. I beat (Thomas) Costello in the Midlands and stopped Cello Rendo in the first round in his home town of Peterborough. You just go in and get the job done. Besides, I’ve got a few Bristol Boys coming across and they’ll make a racket! What are the key factors that you believe will decide the fight in your favour? Preparation and desire. I’ve been pro ten years now and this is my big, big opportunity. I’m so hungry. Friday night I promise you’ll see the best of Danny Butler. It’s now or never. It’s going to be very hard but I’m confident I’ll get the British title fight, which has always been my goal. I’ve mixed with better quality fighters. Everything is spot on. I win because I want it more.